For other uses, see Zaria (disambiguation). Zaria is a major city in Kaduna State in northern Nigeria, as well as being a Local Government Area. Formerly known as Zazzau, it was one of the original seven Hausa city-states. Today, it is known for housing Nigeria's largest university, Ahmadu Bello University, as well as being home to a number of prominent Nigerians. From the 2006 population census, Zaria was estimated to have 408,198 people. It is home to the Zazzau Emirate. Zaria, initially known as Zazzau, was the capital of the Hausa kingdom of Zazzau. Zazzau is thought to have been founded in 1536 and later was renamed after Queen Zaria. Human settlement predates the rise of Zazzau, as the region, like some of its neighbors, had a history of sedentary Hausa settlement, with institutional market exchange and farming. Zaria was the most southern of the Hausa city-states. It was a trading destination for Saharan caravans as well as a prominent city in the Hausa slave trade. In the late 1450s, Islam arrived in Zaria by the way of its sister Habe cities, Kano and Katsina. Along with Islam, trade flourished between the cities as traders brought camel caravans filled with salt in exchange for slaves and grain. The city-state's power peaked under Queen Amina whose military campaigns established a tributary region including the kingdoms of Kano and Katsina. At the end of the 16th century, after Queen Amina's death, Zaria fell under the influence of the Jukun Kingdom and eventually became a tributary state itself. Between the fifteenth and sixteenth century the kingdom became a tributary state of the Songhai Empire. In 1805 it was captured by the Fulani during the Fulani Jihad. British forces led by Frederick Lugard took the city in 1901. A French hostage of the Islamist group Ansaru, held captive at Zaria, escaped in 2013 and reached a police station in the city. In December 2015, Nigeria's military was reported to have killed 300 Shia Muslims and buried their bodies in a mass grave. Although the government denies the event, it has been described as a Massacre. The old part of the city, known as Birnin Zazzau or Zaria-City, was originally surrounded by walls and fortress, which have been mostly removed. The Emir's palace is in the old city. In the old city and the adjacent Tudun Wada neighbourhood people typically reside in traditional adobe compounds. These two neighborhoods are predominantly occupied by the indigenous Hausa. 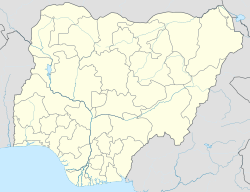 The neighborhoods of Samaru and Sabon Gari are predominantly occupied by Nigerians of southern origin, such as the Igbo. These neighborhoods were formed during the colonial period. The largest marketplace is in Sabon Gari. Other more recent neighborhoods include Danmagaji/Wusasa, PZ, Kongo, GRA-Zaria, Hanwa, Bassawa, Lowcost Kofan-Gayan and Shikka. There is great variety in the architecture of Zaria, with buildings made of clay in the Hausa style juxtaposed with modern, multi-storied university and government buildings. The ward of Anguwan Liman is located north of the Zaria palace. Zaria's economy is primarily based on agriculture. Staples are guinea corn and millet. Cash crops include cotton, groundnuts and tobacco. Not only is Zaria a market town for the surrounding area, it is the home of artisans from traditional crafts like leather work, dyeing and cap making, to tinkers, printshops and furniture makers. Zaria is also the center of a textile industry that for over 200 years has made elaborately hand-embroidered robes that are worn by men throughout Nigeria and West Africa. Because Zaria is north of the rail junction at Kaduna, it has equal rail access to the seaports at Lagos and Port Harcourt. However, only the railway between Lagos and Kano is functional, as the eastern line of Nigeria's rail network is not operational. This means that Zaria currently has rail access to Lagos and Kano to the north but not Port Harcourt. From 1914 to 1927, Zaria was the break-of-gauge junction station for the Bauchi Light Railway to the tin mines at Jos. Zaria is home to Ahmadu Bello University, the largest university in Nigeria and the second largest on the African continent. The institution is very prominent in the fields of Agriculture, Science, Finance, Medicine and Law. Zaria is also the base for the Nigerian College of Aviation Technology, National Research Institute for Chemical Technology, and Barewa College. The school is known for the large number of elites from the region that passed through its academic buildings and counts among its alumni five who were Nigerian heads of state, including the late president Umaru Musa Yar'Adua. (There are two other famous schools in the adjoining town of Wusasa, where the former Head of the Federal Military Government Yakubu Gowon resides: St. Bartholomew's School and Science School Kufena, formerly known as St. Paul's College.) Also MAISS-GIWA a school established by The Emir of Zazzau Dr. Shehu Idris is situated there. Zaria has a tropical savanna climate (Köppen climate classification Aw) with warm weather year-round, a wet season lasting from April to September, and a drier season from October to March. Smith, Michael G. (1960) Government in Zazzau 1800–1950 International African Institute by the Oxford University Press, London, OCLC 293592; reprinted in 1964 and 1970. Dan Isaacs (28 September 2010). "Nigeria's emirs: Power behind the throne". BBC News. Retrieved 29 September 2010. ^ a b c "The Britannica Encyclopedia". Retrieved 4 February 2007. ^ a b c "Zaria | Nigeria". Encyclopædia Britannica. Retrieved 5 November 2016. ^ "Mass graves for '300 Shia Nigerians' in Zaria". BBC News. 23 December 2015. Retrieved 5 November 2016. ^ a b c d e Gihring, Thomas (1984). "Intraurban Activity Patterns among Entrepreneurs in a West African Setting". Geografiska Annaler. Series B, Human Geography. 66 (1): 19–20. doi:10.2307/490525. JSTOR 490525. ^ "Can Nigeria's renovated railway unite north and south?". BBC News. 13 February 2013. Retrieved 11 December 2013. ^ "Trains in Nigeria: A slow but steady new chug". The Economist. 9 February 2013. Retrieved 4 March 2014. ^ "About Us". Nigerian College of Aviation Technology. Archived from the original on April 6, 2010. Retrieved March 27, 2010. ^ "National Research Institute for Chemical Technology (NARICT, Nigerian Institute of Transport Technology (NITT), National Research Institute for Chemical Technology): About Us". Archived from the original on July 24, 2011. Retrieved June 27, 2010. ^ Hotels.ng. "Ahmadu Bello University | Hotels.ng". Hotels.ng. Retrieved 5 November 2016. ^ "Klimatafel von Zaria / Nigeria" (PDF). Baseline climate means (1961-1990) from stations all over the world (in German). Deutscher Wetterdienst. Retrieved 10 August 2016.